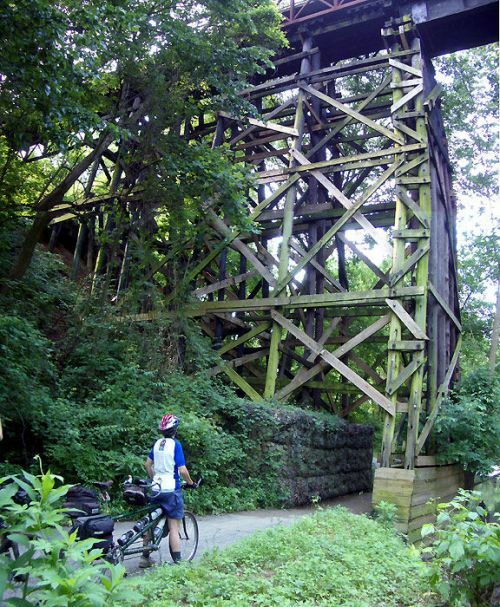 Rock Creek Trail — This 18.6-mile hiker-biker trail features two lakes and offers an alternative transportation route and quiet refuge for a number of communities in a diverse urban setting. Location: Montgomery County, Maryland, Follows Rock Creek north from DC line to Lake Needwood. Rock Creek Trail is an 18.6 mile asphalt hiker-biker trail with two lakes (constructed in the 1960's for flood control and recreation) at its northern end. Lake Needwood in Rock Creek Regional Park offers 7 miles of natural surface trails, picnic areas and rental of canoes, rowboats and paddleboats. The trail surrounding Lake Frank, located in the North Branch System Valley Park, is part of a 7-mile trail system that connects to Meadowside Nature Center. The nature center offers natural, historic and cultural interpretation of the Rock Creek watershed. For example, Rock Creek powered the mills of a thriving milling industry in the early to mid-1800's. Further back in time, the watershed was home to Native Americans, with archaeological sites dating from 7000 BC to the 1600's. From the lakes, Rock Creek Trail follows Rock Creek and connects at its southern end with the Washington, D.C., border and Rock Creek National Park, one of the earliest national parks. Indeed, Presidents Theodore Roosevelt and Woodrow Wilson were frequent visitors to the park. Congress established a regional park system to protect the Maryland portion of Rock Creek, which led to the creation of the Maryland-National park and Planning Commission. Today the mostly wooded hiker-biker trail offers an alternative to high-traffic roads in suburban Maryland. The trail's proximity to a metro (subway) station, major traffic routes and residential areas makes a biking or hiking commute possible for many residents. More importantly, the trail provides quiet refuge and natural experience for a variety of communities in a diverse urban setting.